VATICAN CITY (CNS) — Fifteen-year-old show choir member Molly Biggs of Topeka, Kansas, thought her biggest singing break would be performing in Kansas City. As the New Year dawned, she wasn’t in Kansas anymore. She was standing in St. Peter’s Square Jan. 3 — surrounded by Bernini’s colossal stone colonnade, a splashing fountain and an ancient Egyptian obelisk — getting ready to perform with 33 other Kansans in St. Peter’s Basilica, with the Sistine Chapel choir, at Mass celebrated by Pope Francis for the feast of the Epiphany Jan. 6. Before she fully understood what the choir trip to Rome was really about, “I thought maybe we would come to Rome to watch” the Sistine Chapel Choir sing, “but no, we’re going to go sing with them. My mind was blown,” she told Catholic News Service. 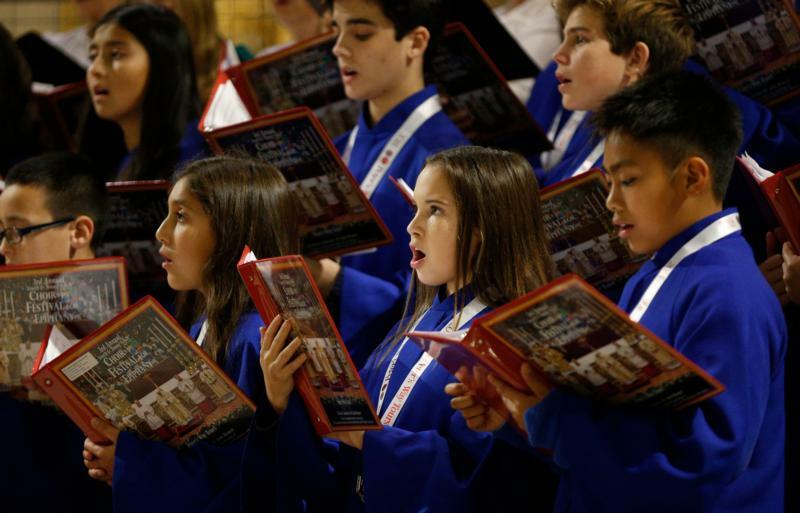 The mastermind behind the choral odyssey was Chris Hubbard, who is the music teacher at St. Matthew’s Catholic school and the director of music ministries at St. Matthew Catholic Church and Mother Teresa of Calcutta Catholic Church in the city of Topeka. The choirs he works with, Hubbard said, only sang at Masses at their local parishes, and the majority of those who came with him had never left the United States, much less visited Italy. Joan Atkins joined the choir at Mother Teresa after her husband passed away in November. The trip was special for her, she said, because she brought with her his rosary, “which he always called, ‘my beads,'” to be blessed by the pope. Hubbard said that once he got people on board, all that was left to do was raise the money for the trip. Cinnamon roll sales, garage sales, BBQ and spaghetti dinners and other events brought in about $30,000 — enough to pay for one choir and split what was left equally among the others, he said. After researching choir tour options, Hubbard said he chose an itinerary with Peter’s Way Tours, a Jericho, New York-based company that specializes in arranging performances for choirs at the Vatican. The weeklong trip Hubbard led included: singing an evening concert with the children’s choir from the Diocese of Orange, California, in Rome’s Church of St. Ignatius Jan. 3; Mass at the Basilica of St. Francis in Assisi Jan. 4; Mass celebrated by U.S. Cardinal Edwin F. O’Brien in St. Peter’s Basilica Jan. 5; and the papal Mass with the Sistine Chapel Choir Jan. 6. Emma said she loves the added knowledge music gives her, “like knowing notes, pitch, melody, rhythm.” Music also “makes people feel more comfortable” and open to new or faith experiences; it is universal and “people of any language can understand it,” she said. The Vatican shares the teen’s view of the value of music, said Msgr. Vincenzo De Gregorio, who heads the Pontifical Institute of Sacred Music in Rome. “The language of art, culture and music” can bring people together in a way that “the language of politics, economics and management” often fail to do, he said. Imagine, the monsignor said, the kind of excitement and emotion these visitors experience when they perform in a space “surrounded by the works of Michelangelo” or other iconic artists. Still, 11-year-old Praizjha Farrant from St. Matthew’s school and the choir at Mother Teresa, was not completely convinced. She said that even though she has a beautiful voice and loves to sing, she hates singing in front of people and planned to “not sing that loud” during the papal Mass. I remember Chris. So glad to hear he is doing so well and touching his students’ lives in such a beautiful way.